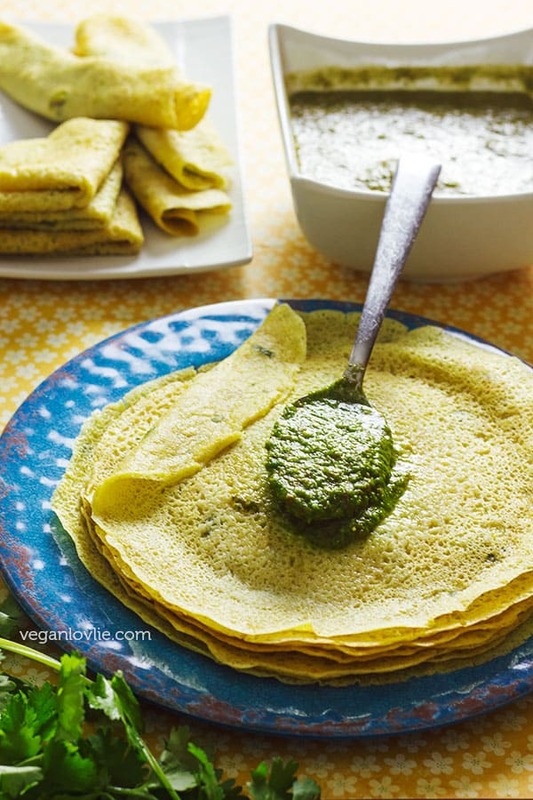 Savoury vegan crepe recipe, made with aquafaba for an unctuous bite appeal. 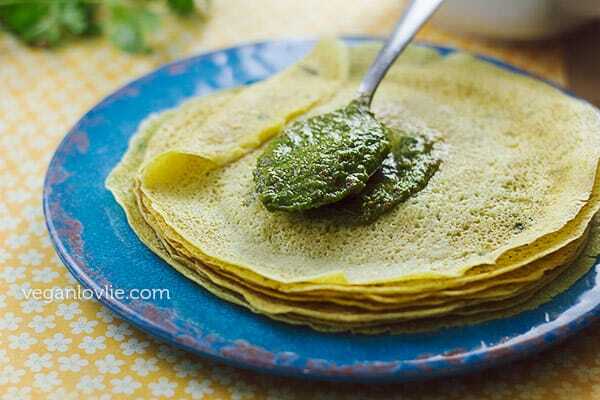 A touch of finely chopped scallions is quintessential to these delectable Mauritian crepes. Eggless crepes to be enjoyed with a smear of coriander (cilantro) chutney for an ultimate Mauritian experience. Cobbled together into the most unique fusion, ingredients from different cuisines weave themselves into the tapestry of richness and intricacy of an evolving cuisine. Whether born out of necessity or as happenstance would have it, by the laws of cause and effect, this leaves one no choice but to relish. 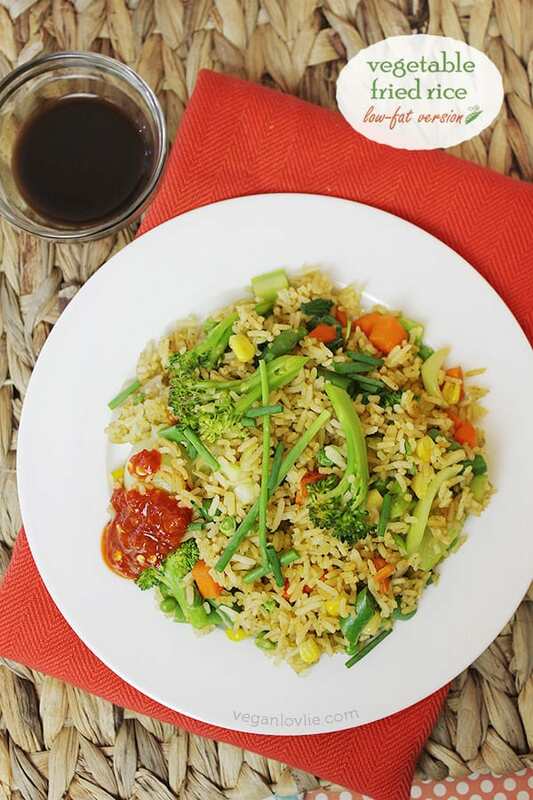 When French crêpes meet a soupçon of finely chopped spring onions, bringing in a Chinese touch to this concoction, you are in for Mauritian savoury indulgence. Not entirely a riff from my previously featured savoury crepe recipe, a gulp of aquafaba* into the batter adds just enough complexity to the texture for that dandy bite appeal. Lending a refreshing note, a smear of coriander chutney as filling seals this unctuous morsel off for an ultimate Mauritian decadent mélange. Take a bite into these delectable savoury vegan crepes and you’ll be left wondering what kind of sorcery has gone into them. It is no wonder why there is no straightforward answer to the question what is Mauritian cuisine like. *Aquafaba is the fancy name for bean juice or chickpea brine/water which I have talked about before. 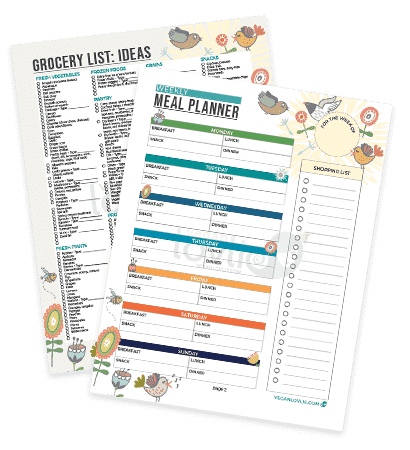 Here are a couple of recipes in which I’ve used it. It’s the liquid that you collect from a can of beans, like chickpeas, white beans or butter beans. I make my own aquafaba as I boil the beans from dry. So, after they are cooked, save the water in which they have been boiling. You can reduce this water to make it thicker. Crepes can be quite a challenge for some. If your crepes turn out to be more like miserable thick and sticky blobs, then read on for these tips. A good pan does make a tremendous difference. You can use a non-stick pan if you wish, but I recommend either a good French made carbon steel crepe pan like this one or a cast iron griddle like the one I have (it is practically indestructible and will last forever if you care for it well). An Indian tawa also works well. Make sure to season these pans properly according to the manufacturer’s instructions before using them. No matter the amount of diligence you put in, a poorly seasoned pan will most probably not spare your delicate crêpes. Each pan is different and you will have to understand the temperature and heat distribution of yours to make successful crepes. Keep adjusting the temperature of the pan as needed, that is if it gets too hot or too cool. If you follow a good recipe, you should get the batter consistency right. But the type of flour you use also affect consistency and you may need to adjust the liquid to get a thin runny batter. Experiment with the first crepe. Then adjust as required. Aquafaba does work its magic into this eggless crepes recipe. Not only does it noticeably add fluffiness to the texture but its eggy characteristic makes the crepe a lot easier to handle when cooking. If you do choose to eliminate the aquafaba, make sure to add a little baking powder into the flour to keep some airiness in the crepes. If the pan is too hot, the batter will cook too fast and you won’t have time to swirl it around properly. Reduce the heat and allow the pan to cool a little. Then continue cooking. Also, the crepe will tend to stick to the pan and may be difficult to detach. If the crepe is too thick or turning out to be pasty, the batter may be too thick. Thin it out with a little water and try again. If you are trying to flip the crepe too early, this very often results in a crepe that ends up into a pasty blob. Be patient and wait for the right moment. If you feel some resistance with the spatula, wait for a few seconds then try to glide the spatula underneath again. Don’t let your attempts at making crepes give you the creeps. To make successful crepes, you have to be present with them. With enough attention and a little patience, your crepes will be successful and soon you’ll be making huge stacks of them. You simply will not be able to get enough. Watch the step-by-step video tutorial and learn how to make successful crepes. 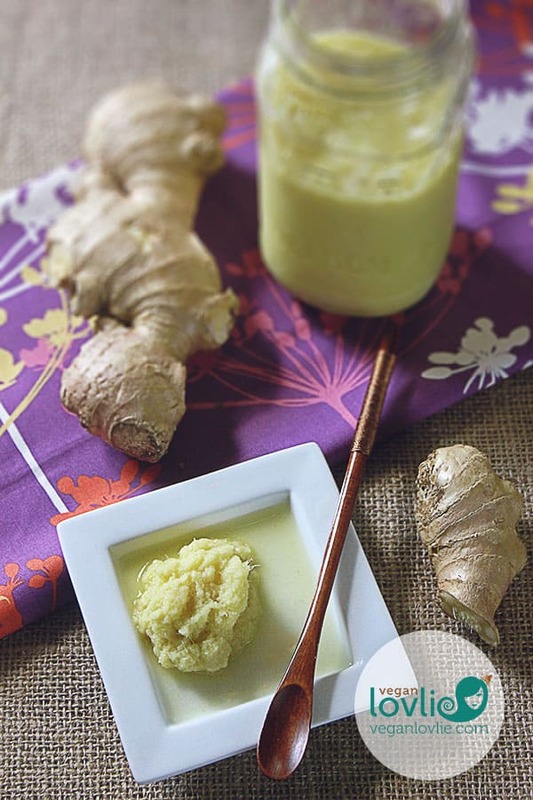 **If using canned coconut milk, use ¾ cup coconut milk + ¾ cup water. Canned coconut milk is too creamy for this recipe and may make the crepes pasty. If you want to substitute the coconut milk with another non-dairy milk (like soy or oat milk), I suggest adding 1 tablespoon of either vegetable, olive or coconut oil in the batter mix. ***Aquafaba is the liquid that comes from a can of beans/chickpeas or the liquid in which beans have been boiling from dried. Finely chop the spring onions. Keep aside. Add all the dry ingredients in a large mixing bowl. Then add in the coconut milk and aquafaba and start whisking until a thick batter is obtained. Keep whisking vigorously to remove all the lumps and also to activate the aquafaba. Add the water to thin out the batter. The batter should be of a pouring or runny consistency. If you are not sure that you can break all the lumps away, simply place all the ingredients in a blender (except for the chopped spring onions) and process until well mixed, or pass the batter through a fine sieve. Then add in the spring onions and mix well to incorporate evenly. Heat a crepe pan or cast iron griddle on medium-high temperature. Brush the pan with a thin layer of oil using a paper towel or a clean piece of cotton cloth. Once the pan is hot (with the first light fumes starting to appear), ladle the batter onto it. Using the back of the spoon, swirl it around into a circular motion to spread it out thinly and evenly. Alternatively, if you have a light pan, you can pick it up and tilt the pan to swirl the batter around into a circular shape. Allow the crepe to cook for about 30 seconds on one side, then slide a thin spatula underneath around the edges. The spatula should be able to easily glide under the crepe. If it doesn’t, wait a few more seconds. Then flip the crepe and cook for another 30 seconds on the other side. Remove from the pan and place on a plate. Repeat for the rest of the batter. Stack the crepes on one another. This will keep them soft (spelt flour may tend to make the crepes a little crispy but when stacked, they will become soft). Serve warm with a refreshing coriander chutney. An unctuous savoury vegan crepe recipe. Great as a snack for anytime of the day or enjoy as a vegan breakfast or brunch with a nice dollop of coriander (cilantro) chutney. If you are not sure you can break all the lumps away, simply place all the ingredients in a blender (except for the chopped spring onions) and process until well mixed, or pass the batter through a fine sieve. Once pan is hot (with the first light fumes starting to appear), ladle the batter onto it. Using the back of the spoon, swirl it around into a circular motion to spread it out thinly and evenly. Alternatively, if you have a light pan, you can pick it up and tilt the pan to swirl the batter around into a circular shape. Remove from the pan and place on a plate. Repeat for the rest of the batter. 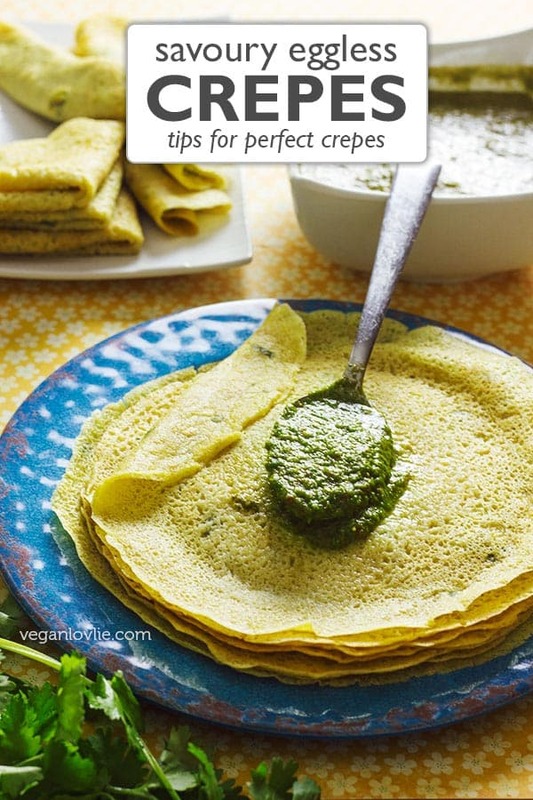 Love this Savoury Vegan Crepe Recipe? Pin it for later. Those look perfect! I’ve always struggled with making crepes, but I haven’t tried them with aquafaba. I’ll definitely use your formula next time. Wonder if aquafaba would work when making a custard since a custard has a unique texture due to eggs and a cream sauce is not the same as a custard. It might work in a custard although I haven’t tried it myself. I usually make vegan custards with cornstarch and non-dairy milk and they turn out pretty good like in this custard pie that I made a while ago – https://veganlovlie.com/vegan-pear-custard-tart-pie/. 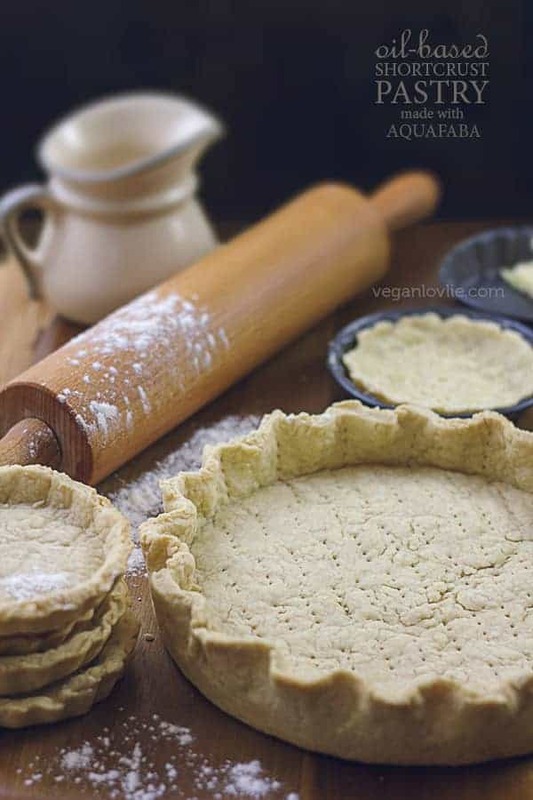 Does the recipe require the chickpea flour? It makes a slight difference to the texture but you can replace it with the spelt flour or all-purpose (plain) flour. Hope this helps.